Click.to is a handy and reliable application designed to offer you access to your favorite apps. 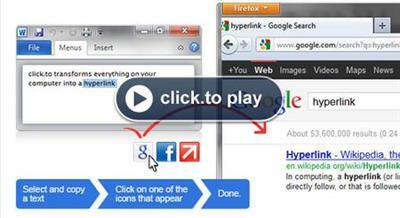 It turns everything on your desktop in hyperlinks, detours between applications can be skipped. Whether you need text added to an e-mail, pictures published on Facebook or a foreign word search in Wikipedia, click.to does it with one click. Content is easily transported (texts, images, e-mails, ) highlight, press Right-click -> Copy or CTRL + C and click on the desired application. An example: To search for a word in Google.Instead of highlighting the word, opening the browser, calling up Google, and pasting the word in the search bar; press Ctrl + C and select click.to Google. Click.to also responds to CTRL + X and pressing of the "print" button, thereby making the process of easier can be customized and added with click.to directly into an email, a document or to Paint, where you can open it and edit. With this application, you'll make your daily work on your computer more efficient. You won't know how many detours you take on on a daily basis, until you've tried click.to. This application can also be individually adjusted to your needs. Click.to is configurable for everyone, and infinitely expandable. Using Click.to you can access your favorite applications and websites from your desktop, by hovering the mouse cursor on a user defined side of the screen. If you use certain extensions more frequently than others, you can display them as Favorites in the Satellite Menu.